A new report from the Bureau of Economic Analysis showed that U.S. gross domestic product (GDP) grew in the first quarter of 2017 by more than previously estimated. 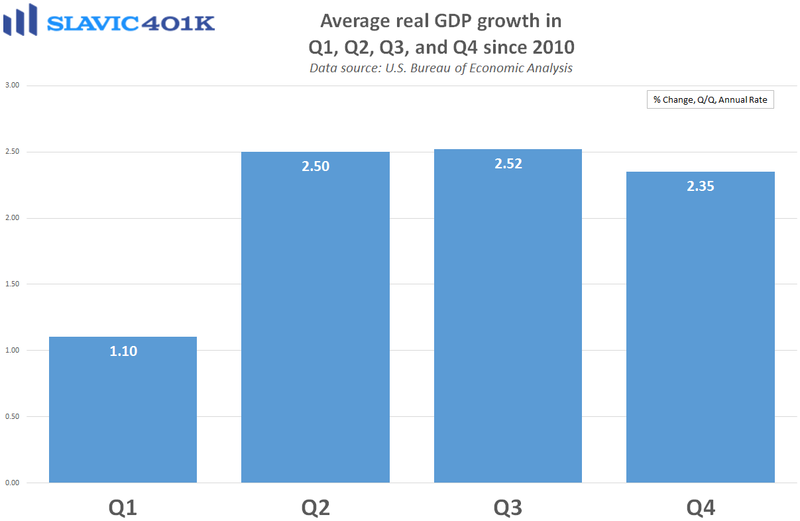 Specifically, real GDP, which measures the value of the production of goods and services in America adjusted for price changes (inflation), increased at an annual rate of 1.4 percent in Q1. That was up markedly from the initial (advance) 0.7 percent estimate, and a better upward-revision than economists had expected. Much of the improvement was due to stronger readings on consumer spending and trade, although the former still grew at the slowest pace since 2013. Nonresidential fixed investment, which includes business spending on equipment, structures, and intellectual property, rose at a 10.4 percent annualized pace in Q1, down from the previous estimate but still the best reading in five years. Altogether, it was encouraging to see that U.S. economic growth during the first quarter of 2017 was not as terrible as initially estimated. 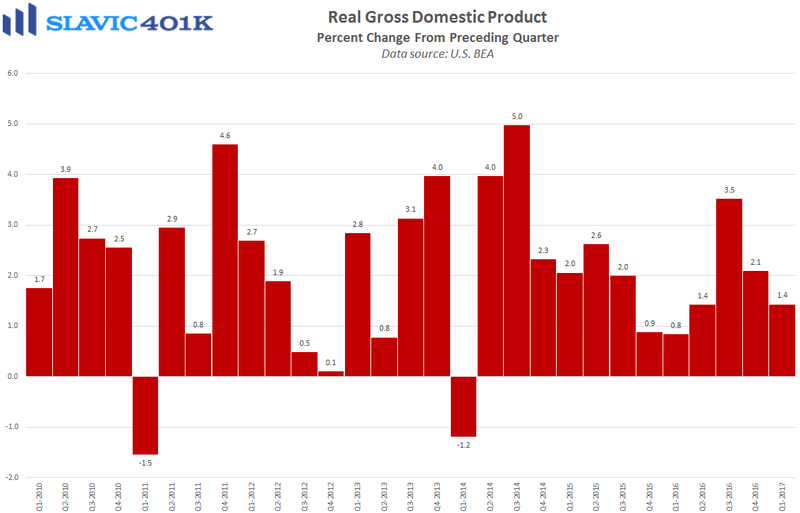 However, the 1.4 percent pace of expansion was still relatively weak and maintained the recent pattern of Q1 sluggishness (second chart above). Officials at the Federal Reserve have said that they believe the slowdown in the first quarter will prove to be transitory, helped by rising wages that should support a consumer-led rebound in Q2. Moreover, most analysts expect GDP growth to accelerate in the second quarter of 2017, with forecasts currently ranging from +1.9% to +2.9%.